Climate change signals in Saudi Arabia are investigated using the surface air temperature (SAT) data of 19 meteorological stations, well distributed across the country. Analyses are performed using cumulative sum, cumulative annual mean, and the Mann–Kendall rank statistical test for the period of 1978–2010. A notable change in SAT for the majority of stations is found around 1997. The results show a negative temperature trend (cooling) for all stations during the first period (1978–1997), followed by a positive trend (warming) in the second period (1998–2010) with reference to the entire period of analysis. The Mann–Kendall test confirms that there is no abrupt cooling at any station during the analysis period, reflecting the warming trend across the country. The warming trend is found to be 0.06 °C/year, while the cooling trend is 0.03 °C/year, which are statistically significant. 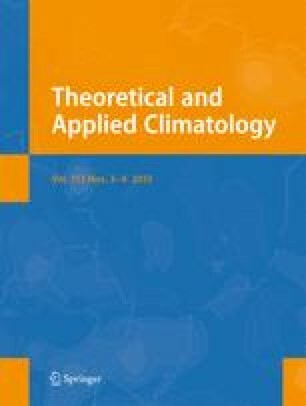 The authors are grateful to the Presidency of Meteorology and Environment in Saudi Arabia for allowing the use of the monthly mean Saudi Arabian station temperature data and to King Abdulaziz University for providing the facilities and logistical needs for this study.